“The cyber attacks from China made up 35% of the total number of cyber attacks on official Indian websites, followed by US (17%), Russia (15%), Pakistan (9%), Canada (7%) and Germany (5%),” the report says. A report sent to the National Security Council Secretariat (NSCS) and other security agencies by a department under the Ministry of Electronics and Information Technology has said that the maximum number of cyber attacks on official Indian websites are from China, US and Russia. It has also flagged the possibility of “malicious actors from Pakistan using German and Canadian cyberspace for intruding into Indian cyberspace and carrying out malicious activities”. The report, prepared by the Indian Computer Emergency Response Team (CERT-In), which comes under the ministry, analysed cyber attacks from April-June 2018. CERT-In is the nodal agency which deals with cyber security threats like hacking and phishing. It collects, analyses and disseminates information on “cyber incidents”, and also issues alerts on “cyber security incidents”. 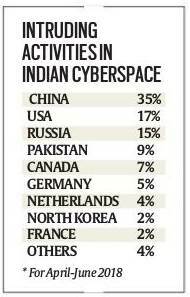 According to the report, it has been observed that China continues to “intrude” Indian cyberspace in a “significant” way. “The cyber attacks from China made up 35% of the total number of cyber attacks on official Indian websites, followed by US (17%), Russia (15%), Pakistan (9%), Canada (7%) and Germany (5%),” it says. “Many of the institutions impacted by the malicious activities have been identified, and they have been advised to take appropriate preventive action. These include Oil and Natural Gas Corporation (ONGC), National Informatics Centre (NIC), Indian Railway Catering and Tourism Corporation (IRCTC), Railways, Centre for Railway Information Systems (CRIS) and some banks like Punjab National Bank, Oriental Bank of Commerce, State Bank of India and state data centres, particularly in Maharashtra, Madhya Pradesh and Karnataka,” it says. “The activities relating to intruding into the cyberspace are being regularly monitored. China continues to be intruding the cyberspace in a significant way followed by the US and Russia. It has also been observed that intruding activities are coming from Canadian and German cyberspace — most possibly suspected to have originated from Pakistan actors to target Indian wesbites,” it states. “They are targeting by sending spear phishing emails with malware attachments. Phishing attacks are usually in the form of an email from a trusted source where they ask for personal details such as bank details personal details, passwords,” explained an official.